Rolls-Royce is one of the leading companies in the development and production of propulsion jet systems, for various sectors such as military, mercantile, high speed sea transportation and naturally pleasure yachting. The Rolls-Royce hydro-jet sea propulsion systems carry the Kamewa mark and are divided up into four different series, the S series for fast ferries used on over 1,400 ferries throughout the world, the A series with 100% aluminium hydro-jets to be used for high performance boats, the FF series designed for the needs of vessels equipped with semi-planing hulls and planing hulls with displacement between 6,500 and 160,000 lbs. and, finally, the APS series - acronym for Advanced Propulsion System, identifying a system developed especially for Volvo Penta engines from 200 to 800 HP which is marketed using the same sales network of the Swedish company. Kamewa is a Swedish company taken over by a British colossus, which boasts a long experience in the sector of hydro-jet propulsion, systems used on thousands of ships and boats all over the world. Remaining in our particular favourite sector, pleasure yachting, let's take for example the Ab Yachts boatyard, part of the Fipa Group, which chooses to install this type of propulsion on all of its models. This Italian boatyard believes that the hydro-jet is the best propulsion system for high performance yachts and for high safety levels. Without doubt this type of propulsion offers very high performance levels, as well as the advantage of not needing special maintenance and of being suitable for manoeuvres even in shallow waters. As already mentioned, the Kamewa A series is made entirely in aluminium, with stainless steel internal propeller and flow management system. Modern techniques are used to develop the design for these jets, including the 3D CAD/CAM, in order to ensure a high level of quality and precision both at the planning and assembly stages of each single element. Rolls-Royce has its own testing and trial centre, where the results obtained and developed in each single application are compared daily, so as to allow the identification of the most suitable diameter and inclination of the propeller blades for the different application of its products. The Kamewa A series hydro-jets are recommended by Rolls-Royce for planing boats required to produce a speed of over 30 knots with displacement between 31,000 and 218,000 lbs., allowing for single, double, triple and even quadruple installation. The characteristics of this series, besides its limited weight due to its aluminium structure, lie in the high propulsive efficiency they offer, allowing a reduced consumption for the same propulsion. Thanks to the materials used for all the system components, the Kamewa hydro-jets are guaranteed free from problems such as corrosion; none of the immersed parts are, in fact, sensitive to the deteriorating agents of the marine environment. 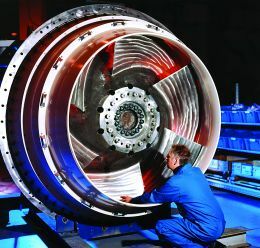 Rolls-Royce produces a vast range of products dedicated to the shipping sector, such as gas turbines, nuclear reactors, shipping design, propeller or jet propulsion systems and integrated electronic systems for system management. The marine sector of this British company relies on the daily work of 7,300 employees, working at its production plants in England, the United States and Scandinavia. At present, high technology products by Rolls-Royce for the shipping sector are distributed in 34 countries and used on over 20,000 among ships of various types and pleasure boats. To quote just a few applications of Rolls-Royce products, present and future, we signal their presence on board English class Type 45 torpedo-boat destroyers. Furthermore, they will be fitted on English attack submarines to be built in the near future and are already in use on American, French, Australian and Korean surface military units. 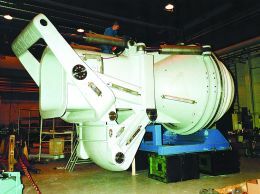 In 1998 the company was chosen to design the new nuclear reactor for the Royal Navy's future class of Astute submarines. Rolls-Royce also operates successfully in the aircraft sector, both civil and military, for which it manufactures all kinds of propulsion systems used by numerous aircrafts of no less than 41 international airlines out of the world's top 50, as well as by numerous military aircraft including the future Eurofighter Typhoon and the F-35 Joint Strike Fighters. Suffice to say that at the moment there are more than 54,000 Rolls-Royce turbines working on board helicopters, military jets, transport planes and scheduled passenger planes. We could go on forever about Rolls- Royce, for example about its commitment in the design and production of nuclear reactors to generate electricity or other prestigious projects completed successfully in various fields, both civil and military, but for obvious reasons of space we stop here, inviting those of you who want to know more about it to visit the website www.rolls-royce.com.